Tonight on BBC4 from 8pm there's a series of programmes about Glastonbury. Apart from a best of compiliation, there's this which looks good. We're used to seeing megastars mesmerise crowds of thousands, but what's it like to play a festival like Glastonbury for the first time? Film-maker Rachel Davies follows three very different acts as they prepare to play one of the more modest stages: Birmingham hip-hop group DME, who aren't at all sure about this camping lark; Manchester fraternity Celt Islam; and nervy singer/songwriter Lettie. 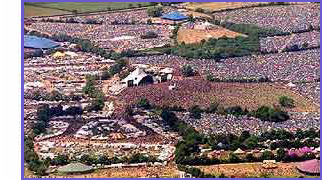 Those already nostalgic for that cloudless June weekend should stay tuned for Glastonbury at 40: From Avalon to Jay-Z, which features cracking performances from Iggy Pop, Bruce Springsteen and a badly coiffed Bowie interspersed with cows, hippies and circus acts (8:50pm). This year's highlights follow (10:50pm).